"Great Platform & Exceptional Service and Insights from Eric Bergman's Team "
Brightedge has been tremendously useful for me, personally, as well as our entire SEO department. We have worked with a variety of different platforms and Brightedge continues to be the industry leader, for good reason. Eric and his team go way above and beyond to help our team set up reports to help tell their client's narrative. Not only do they help us to envision and create reports, but, they are always happy to discuss specific insights and strategy. Kevin McCormick specifically has been an extremely useful resource for me and our team helping build out reports for very unique scenarios. It is very clear he understands the industry, data and platform extremely well. Thank you team, this review is well overdue! It would be wonderful if there was a way Data Cube could show which keywords fell off or began ranking month to month. The platform is constantly evolving and they are extremely open to recommendations for improvements. Exceptional Service from Eric and Kevin's team with Incredibly Useful Insights. "Helping me lock down SEO wins"
The depth of tracking and the constant reminders and advice on every level are helpful when I am such a small team stretched trying to do wear many hats. I need this automated tracking and data feedback, I need this quick ability to see where I am week by week and spot the good and the bad. The ability to mark up events so I know the changes outside the platform is nice so I can track all the items affecting rankings, so I can better track what is causing changes. We are using the "LEM" (Link Equity Manager) internal link manager, so far so good on that as well. I don't have time to manage an internal link scheme on top of my other SEO/SEM tasks. Since I am mostly assigning tasks to myself, I'd love to be able to do it faster/in bulk to mass assign myself tons of recommendations, so I can more quickly have it track when they are done (which it does on it's own without me closing the task, thankfully). Try to implement a system when you can track all your main changes and events in Brightedge or at least another system so you can use the data and track all your site changes back to the results they track. SEO goals. So far we've popped up dramatically on initial optimizations and it is also identifying problems as they occur which allowed me to respond quickly and fix an issue that cropped up from some new development. The level of staffing I get for questions and assistance is helpful. "In-Depth Platform With Professional & Skilled Support"
BrightEdge has given our agency an immense advantage over competitors and provided actionable insights that very few other platforms can deliver. Customer support with BrightEdge is top-notch and they were always available when we needed them. Our main support representative, Kevin McCormick, was absolutely beneficial to our needs and knowledgeable on every aspect of their platform. His detailed insights and knack for creating custom dashboards helped us understand the performance of our clients and their competitors better. Overall, BrightEdge is a game changer that has helped us make a digital impact on client projects. I highly recommend that you take a look for yourself...you'll be glad you did! A big thanks to BrightEdge and it's talented support team! There were a lot of videos to review for the BrightEdge exam. Although I'm now BrightEdge Certified, consolidating some videos may be more effective. The amount of data that you'll gain is immeasurable if you're looking to get ahead in Digital Marketing. Insights beyond standard charts and numbers. We're able to keep better track of keyword performance and the ability to identify how competitors are using target terms to engage their audience is also helpful. "Comprehensive Tools + Knowledgeable Resources"
The Data Cube in Brightedge is a powerful tool for topic and keyword research and it comes in handy all the time. I use it for prioritizing topics for content, evaluating competitors and content ideation. I also love to work with Brightedge's professional services team. We've leveraged their expertise for migration support, technical audits and keyword audits - all with great results. There's definitely a learning curve with the onboarding process. It can take a while to get up and running with the platform and various tools. Also, the Content tool could be more user friendly. The migration support has been key with our recent website re-platforming projects. We did not experience a drop in traffic with any of the websites, which is a major win. "BrightEdge helped us establish a solid SEO plan across multiple properties." The Data Cube is a tremendous tool to gauge potential SEO opportunities and traffic grabs. And their Content IQ has made adoption very enticing for our content writers. From a reporting standpoint, we pull up their Performance Dashboard to review weekly with our content writers, web designers and programmers. We just recently switched our BrightEdge support team. Takes awhile to get up and running to where we have a relationship and understanding of our unique business needs. Like dating again when you've been married for awhile. The platform allows users to gain as much as they bring to the data. Content writers may go in a few times a month, while our digital marketing analyst may be in the platform every day. The data improvement points and opportunities are reported every month in our key businesses (Cosmetics, Crafts) in our trifecta of social marketing, website builds and organic search gain. "Best SEO Tool for B2B"
The most challenging part of SEO is that the rules keep changing and best practices are becoming more specific by industry. BrightEdge keeps you current. With their weekly Insights email, even the most beginner user can make quick changes that result in big gains. DataCube and ample reporting keep more advanced users busy. And their team of experts is always just a phone call away. For larger corporate websites, it's important to be able to filter out sections and subdomains that don't apply to your team. BrightEdge has incorporated this ability on some of their features, but not all. Still waiting on these updates. The majority of our leads come from the website via form fills. Our goals were to not only increase the conversion rate on our website, but also increase the quality of those conversions. Organic traffic is the highest quality traffic we get. After a few months using BrightEdge, our web manager reported that our conversion rate had increased by almost 2 percentage points and 68% of conversions were coming from organic. That immediately results in better leads for our Sales team. "Marketing Data and SEO Professional"
My favorite BrightEdge feature is the Anomaly detection. I receive emails on a weekly basis detailing out which of my tracked keywords have dropped out of page 1 with action-based recommendations I can use to optimize my web pages and get them back on page 1. The Insights tool could use some improvement. Every so often, there are actionable items that I can use to improve my ranking, but more often than not, the insights are not actionable or they are too general for me to be able to fix anything specific on my website. BrightEdge allows me to show BMC leadership the value of a high search engine ranking and of SEO in general. I am able to clearly show them how our page ranking affects traffic to our website which then affects online conversion on the site. "Easy-to-use platform and professional support"
The dashboard is intuitive and easy to use. As our team does not have any prior experience using an SEO platform, this has been a great relief. Also, we are able to run in-depth reports on our website’s performance – especially around keywords – which is helping us to refine our content strategy. Not a lot! Some of the reports can be difficult to decipher, but this hasn’t been a problem as our rep, Nick, is always on hand to help. Data Cube is helping us to overhaul our SEO strategy across the business, so that we can reach a wider audience with our content. In the past, we have produced content that could have been better optimised, and therefore did not perform as well as it should have. Now, we are able to use advanced data – especially around keywords – to identify the topics our customers want to read about. This means we can write relevant content that is effectively optimised beforehand, rather than optimising content after it has been written. We look forward to seeing the long-term lift this new strategy has on our content performance. "True to their name: BRIGHT People & Tools which give us the ultimate competitive EDGE"
Fantastic, cutting edge tools: My favorite is the data cube tool that gives us great insight into the search landscape. BrightEdge is always innovating too, so I feel like simply being part of the BrightEdge family keeps us innovative as well. Great support: Everyone I've worked with in BrightEdge, especially my current client success manager (and my other three were fantastic too!) has been very helpful and caters to my company's needs. They're willing to put in the hours to help us be successful. Because they have so many different features on the platform, it could take a little time to get used to the different interfaces, but this is more so if you aren't in the platform enough. Once you use it more, you definitely get the swing of things easily. The great thing about BrightEdge is that they're open to suggestions, so if you think there's a better way to do something, or if there's a feature you think is missing, just tell them! Take a look at their features online or talk to a representative and they'll be happy to show you around the platform. If you want to do well in search, BrightEdge is a fantastic platform and team to help you make great progress. One huge business problem is showing the value of SEO to people in our company that matter. With BrightEdge's visually powerful dashboards and the help of my awesome CSM(s), I've been able to communicate that much more easily. We have niche markets, and many of them, so it can be overwhelming to try to take on everything. My CSM has worked with me to to tackle different projects little by little and segment them on the platform. "Enterprise SEO at Scale, Great Value, Best in Class"
Breadth & Depth of Solution. As someone who has been involved with SEO and organic marketing for over 12 years, the hardest challenge is to keep up with the hundreds of search engine algorithm changes. Brightedge consolidates several tools in one integrated platform, provides collaborative capabilities across devices, has excellent customer support and certification to make you use the platform effectively, and more importantly, it works! The proof of the pudding is ranking on page 1 of Google, across content types, with engagement that results in better business outcomes for our clients, while saving us time and $$. Minor quibble, I prefer using it on desktop to make better use of the data and insights. A bigger screen works more effectively for my workflow. Get a demo to realize how easy it is to get insights using Data cube in minutes. Storybuilder - Besides Datacube, this is my second favorite 'feature'. It helps tell a data-driven story that is visual, engaging and not constrained by system limitations. We craft stories different for different clients based on their needs. Note: There are many other features to explore, including Content IQ, Hyper Local (drill down to local searches, esp. useful for retailers or multi-location businesses). Also, Brightedge has frequent User Groups across the US. I learn a lot from engaging with fellow marketers and SEO/Content managers on how they are leveraging BrightEdge to address organic marketing challenges. BrightEdge is a powerful tool to support one of the biggest challenges in SEO, showing a client ROI. Top features for me would be the advanced keyword tracking, search volume, estimated clicks per keyword, page reporting, competitor comparison, automatic and manual task tracking and management, data cube, scanning and tracking for various keyword categories: images, video, regular web listings, local 3-pack, carousel, places, quick answers, etc. would like dashboard reports to be under clients name instead of all bunched in together. Would like the option to change the colors on dashboards so that colors that are really close like teal and blue don't get mixed up. Best software for research, tracking, and showing ROI. The ability to show a client their ROI each month/quarter. "Easy-to-Use for not only SEOs but for non-technical people as well"
We are a publishing company and the SEO team finds it useful to easily do research and reporting within the platform. Our editors who are not as tech savvy find it easy to use when doing keyword research or getting an idea how their keywords are ranking or how they stack up against their competition. BrightEdge Recommendations is also helpful for non-tech savvy people to understand. With other platforms there is a lot of filtering involved and the more clicks or input fields a non-tech savvy person has to do, the more confusing it will be for them and the adoption of the software will be poor. With BrightEdge, there is less filtering compared to other platforms so adoption rate and easy of use will be higher for others when doing keyword research or competitive analysis. The technical SEO aspect when it comes to crawling and site audits are not as robust as other SEO platforms. If it had more Technical SEO data and features in their Content IQ, then it would help the SEO team a lot. SEO platforms depend on your flavor. If there were no one else except the SEO team that is using the platform then I would say that BrightEdge is good. If only the SEO team was utilizing BrightEdge, I would like to see more in-depth Technical SEO features like the other platforms offer. The business problems we were trying to solve as a publishing company was finding an easy-to-use SEO platform that our journalists and the SEO Team could both use. The other competitors have very robust SEO tools that are great for SEO people, but would seem too complicated for non-technical people when trying to navigate and apply filters within the platform. BrightEdge had a balance of both where non-tech savvy and the SEO Team could both use the platform to help grow the company. "Agency Partner Needed Best in Class Content and Keyword Strategy Solution"
Opportunity Forecasting: Quantify the potential improvement that an investment in a specific Keyword or Page Grouping would deliver. Story Builder Dashboards: Create templates that we can copy/paste across our client portfolio to show the overall impact of investing resources in web engineering, SEO and web strategy. Site Audit tools: BrightEdge doesn't do a fantastic job of performing a holistic site audit for our root domains. Backlink and Internal Linking features: Pretty bare bones here. You'll want to invest in DeepCrawl, SEMrush or another tool to help out with link analysis. BrightEdge really shines on the keyword strategy as well as content auditing and strategy front. While they offer backlink and other link analysis tools within the product, you'd be better off using SEMrush or Screaming Frog to grab that kind of information. Quantifying our Efforts: BrightEdge makes it crystal clear how our collective efforts are improving SEO performance as well as business-level performance from Organic Search. Automation: Using features like 'Add Task' allows us to use BrightEdge to review changes on the website and make annotations in the platform when different optimizations are made. "Tracking Technical & On-page Implementations with Ease!" What I like best about the tool is the custom dashboard you can create for client side viewing. Is allows them to see the progress that is taking place within SEO. Tracking pages has deemed to be really useful for our agency after we implement metadata optimizations. The system does feel slow at times when loading or submitting data. This becomes understandable as there is most likely a lot of computing taking place behind the scenes of the tool. BrightEdge will allow you to achieve small seo wins without thinking twice. When setup properly, it will suggest on-page/ technical recommendations that you can send to client and track whether it has been implemented or now. It just allow this part of the process to be much smoother. Opportunity forecast is slowly showing its potential as we begin to use it more and more for each client. Page tracking is another feature that our SEO really enjoys using for tracking content related updates to URLs. We are looking to solve tracking of our on-page, and technical implementations for clients. BE is allowing us to easily build that portfolio of what has been done of the SEO side for improvements. The data will deem itself useful when it comes time for QBRs. "Everything you need (and more) to run a successful SEO program!" The BrightEdge SEO platform offers access to a tremendous depth of insightful data that can be used to better inform your SEO strategies and ensure program success. We leverage the platform for virtually all of our SEO clients, and have found a benefit both in terms of the overall results; as well as our internal efficiency in identifying and executing on opportunities. We've also found that the platform offers a large benefit to our content creators and copywriters, who now have a streamlined process that leverages BrightEdge to identify search demand and better understand what to write about based on the intent behind the customer's searches. This has made our content more effective both in terms of traffic and conversion. Like all rich platforms, you'll get out of it what you put in. The user interface is simple and easy to use; but in order to leverage the advanced features (which are super powerful), you'll need to invest a little in training. We've found their online training videos to be great resources. In the event that you may need hands on training, their team has been excellent to work with. Think of the value beyond just "SEO" ... what can the software offer to your overall content marketing efforts? Our goal is to improve the organic footprint, traffic and revenue generation for a wide variety of clients across industries. "The SEO Platform That Helps You Tell a Story That Gets Heard"
Using BrightEdge has changed my relationship with SEO. Thanks to a robust on-boarding period, their (mostly) intuitive platform, and ongoing support, keyword research is a breeze. Some actions are more tedious or take longer than I would like. The one example, is keyword research using the Data Cube. If I search for a specific term that then returns 1,000 results, I have to click through (alphabetically) until I find the exact term I was interested in. Another is how long it takes for a term to show up when you assign it a preferred landing page. We are in the early stages of our SEO initiative. To date, I think it is making the content team more intentional in its efforts. Already, we are creating a more organized, holistic experience across the company's site. The BrightEdge user interface is intuitive and easy to navigate. BrightEdge has developed great training resources that make it easy for multiple people across the company to become power users quickly. Their customer service is excellent making us feel like they are an extended part of the team. BrightEdge has been receptive to feature requests and feedback. We are waiting for the day when we can further customize the Brightedge Insights report email to be specific for users. BrightEdge allows us to efficiently pull insights and track keywords that are important to our business. This tool helps us monitor trends and measure impact of micro-optimizations. We also find great value in ContentIQ to catch technical breaks. Ease of use in creating the dashboards, the storybuilder functionality and BrightEdge constantly updating the platform to make it more helpful. Also has an intuitive design and creates bright, attractive reports. DataCube and competitor analysis. It is difficult and time consuming to build out keyword lists for everything. It can be made a little easier to change keyword groups across all charts inside of a dashboard, or attribute one keyword to multiple groups for instance. It also does not handle the tracking of two domains as a single marketing channel (although this was only specific to our sites in a fairly uncommon case). Larger exports for datacube would be helpful. Use this platform to track, manage and improve SEO campaigns as well as report to upper management. It can also help you create content, and the datacube has insights on your competitors. Improved awareness of SEO, recommendations to improve content, tracking of keyword ranks and access to ranking data on multiple terms through Data Cube along with competitor information. "I enjoy the user friendly features available. " I like that the dashboard is user friendly and makes SEO easier to understand for beginners like myself. I also like the customization tools. Our rep contacts us a lot. Usually I would love this, but I think he connects with us so much that we do not have enough to talk about each time. I wish we could set up meetings quarterly versus every two weeks. See if you can set up monthly or quarterly meetings with your account manager. Ours is a little too eager to meet. It has allowed us to improve our SEO. We have seen benefits for content development and have really begun to focus on our SEO strategy. "An Enterprise SEO's Best Friend"
What I like most about Brightedge is their Data Cube and Content IQ. These are the two areas I use the most when I'm using Brightedge. Data Cube provides a wealth of great information not only your website, but competitor sites as well. It's very hard to get as granular with organic traffic and keywords other tools that I've used. I run Content IQ once, sometimes twice a week to see what things I can easily fix like title tags as well as identify any issues that may be going on with the website's performance. The only thing I really dislike is the cap at which we're at when looking at the number of pages and keywords we can track. Since we have thousands of pages and hundreds of keywords we could track, it's not possible from a budget perspective to track each page or keyword in Brightedge, although I would love to be able to! Worth the money if you own or manage an enterprise level ecommerce website. With Brightedge, we're identifying organic keyword and content opportunities we should be pursuing to grow traffic and revenue. We also use Brightedge to decrease our reporting time, which saves our company time and money we can use on executing our work. So far we have been happy with the power of the tool and have seen organic keywords continue to increase over the past few months for a couple of our sites. Brightedge has also been helpful in identifying future content ideas based on the type of search result desired. "We couldn't do what we do without BrightEdge." The tools are robust and informative, but more important than that is the culture of excellence we've seen permeate through the entire organization. There's excellence in continuing innovation, excellence in support, and excellence in day-to-day account management by their teams. I'd love more customization as an admin. We're in a phase where we want to drastically scale up BrightEdge usage and access across our corporation, but are hesitant to do it without being able to ONLY serve certain parts of the platform. This is a super nitpicky thing to be concerned about, but it's our primary pain point right now...and it's not necessarily a huge one. BrightEdge can take an SEO team of 1 and give it the capabilities it needs to be much larger, faster and impactful than could have otherwise been the case. I've been a BrightEdge user on both the agency and the client side now, and have fielded demos from other competitors over the years. BrightEdge is the clear industry leader. We're a small search team, within a large company, with a lot of demands for our time and attention. There is only one full-time SEO strategist in the entire company -- me. What BrigthEdge allows me to do is not only do my own analysis, reporting and tracking in a quick and efficient manner, but it also allows me to delegate. Instead of having to do research for our writers, I am able to give our editorial staff the keys to their own BrightEdge accounts to do their own research. We now have a stable of search-savvy copywriters who don't need me in their business for us all to create quality content! "Best SEO Marketing Platform for Fortune 500 Companies"
I like that BrightEdge is an all-in-one SEO marketing platform, and the best in class (really in a class all its own when compared to everything else on the market). It's ideal for running high performance SEO campaigns for Fortune 500 companies. I especially like the SEO research capabilities, as well as the AI powered recommendations and custom reporting. Because BrightEdge is a premium solution, it takes some time transitioning from all the smaller toolsets many SEOs use (often simultaneously) to a larger platform. But, like anything else, it takes time, and once fully oriented worth the effort. Large companies are investing heavily in SEO, as it has fully evolved into a revenue generating powerhouse. BrightEdge's platform makes it possible to research, audit, prioritize, and recommend strategies that elevate more pages on the first page of Google, where the real traffic & revenues follow. The superb reporting justifies the investment, often showing strong returns in a very short amount of time. What I like best about BrightEdge is the flexibility of the Story Builder functionality and the power of Data Cube which can provide SEO performance info for any website. I dislike the fact that for several edits such as the addition of a new domain to the platform (assuming there is an available slot) or edits as to the way the URLs appear in the page reporting functionality have to go through the support team. I would prefer that the users would be more empowered to make edits on the platform and so only contact support when there is a problem. BrightEdge is a really powerful tool and can help businesses take the next step forward towards perfecting their website's SEO performance with ease. Keyword Research, SEO performance tracking and reporting, decision of the next SEO step for improvement of our and our clients' website performance. "The Platform to Power Content Marketing "
The volume of data the BrightEdge platform is tapping into is massive and the tools their product team are constantly layering on top to inform strategies for our clients is top of class. I use Data Cube on a daily basis to identify opportunities with clients. There isn't much however the technical crawls aren't always as thorough as we're looking for to support clients for technical SEO however we have our own tools to augment this so it's never been an issue as the benefits of the platform way out perform this limitation. As an agency, we're using BrightEdge with all of our clients to support our content marketing efforts related to integrated search strategies. The competitive intelligence and keyword research tools are extremely insightful for us to inform our strategies and tactics. "Every SEO Metric Needed in One Place"
Wow - where do I begin? I like the depth of tools that are in BrightEdge. Anything from keyword tracking to organic traffic (internationally as well), to content evaluation. The tool tells you what you need to do to the page in order to rank better and also provides insight to what the competitors are doing. The latest enhancement provides a really great technical audit that is completely customizable. They are releasing so many new enhancements to the tool that it is hard to keep up! I had looked at all other enterprise SEO tools out there and evaluated them thoroughly. Don't let anyone tell you different. This is by far the best tool out there! Lack of organic traffic - this tool allowed me to find better competitive keywords and then properly optimize on page and off page to get better traffic. "Great new CMS with a variety of features"
Diving beyond just regular metrics into really interesting analytics is really easy and cool to see here. BrightEdge makes SEO optimization so much easier than any other platform I've used. It's still super new, so it's been super glitchy for us. But the dev/tech team has been responsive and implemented the changes we've needed. Take time at the beginning to fully train in what the platform offers. There are so many cool little things inside, but remembering them all and how to use them (especially for someone who's relatively new to SEO) can be daunting. But otherwise, it's a great editorial tool. We use BrightEdge as a blog platform for one of our brands, and we're really focusing hard on SEO right now, so it makes my job easier and tasks easier to perform. Our exec team has enjoyed the additional features this provides us and the info we're getting as well. BrightEdge has great customer support and a great product for us at Bleacher Report. As customers since late 2016 we are very happy using BrightEdge and have been able to successfully complete SEO related initiatives. Being able to compare ourselves to competitors and understanding where we can improve has been super important for us. Additionally we are more easily able to find issues with title tags, keywords descriptions and more. "Good SEO platform but a bit pricey"
Data cube allows for access to lots of data around not only your website but competitors. It's very easy to use for most people at our company so getting adoption isn't too big of a problem. The UX/UI is fairly easy to use. The inability access the data via API for a large enterprise this is important. This keeps us from allowing our data scientists to mine the data to look for opportunities that are there. Also with a large website and millions of keywords, the pricing plan is unsustainable for a large amount of keywords. There are other vendors out there that can do similar for a lot less and with more flexible structure. The value is the ease of use but if you have ability in house to do more, this prevents you from reaching the next level. We are able to track keywords and content marketing efforts. "De-mystifies SEO ... for the most part"
BrightEdge takes a dark art and makes it mostly understandable and straightforward. It lays out tasks in a very linear manner, and tells you what you need to do to get your site ranking better in the major search engines. The onboarding is process is excellent as well, but we were generating usable insights out of BrightEdge on Day 1. Every time you track keywords off a master keyword list it takes to back to page 1 of the list. With a long list that can get very frustrating. Also, changing the rank order in a report sometime requires drilling into a secondary menu. Finally, it's garbage in/garbage out. If you track misspelled keywords BrightEdge will tell you to add those keywords to your content. Take the leap! Brightedge has great support and will help you de-mystify this dark art. It enables us to do our own SEO with minimal employee resource, and save money in the process. 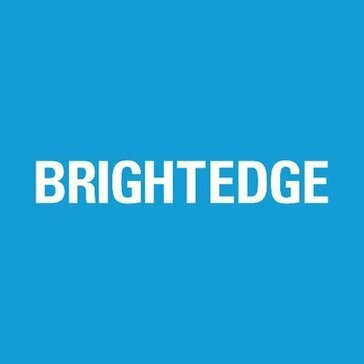 "Solid and innovative platform, but at a high price point"
I have used BrightEdge for several years, and for me, what sets it apart from other platforms is the customer service - particularly the account reps. Our reps meet with us monthly to go through new platform updates and to help us diagnose issues. They work with you to analyze your search data and identify new opportunities. It's like having an extra member of the team! Fantastic individuals who have provided a lot of value for us in the past. Pricing has become somewhat ridiculous. You are charged separately for each device and location you want to track, all on a keyword-level - which means that if you want to track a single keyword on all major devices, you need to pay 3X the price. It has become cost-prohibitive for many of our clients. Search rank tracking over time, technical site health, and search and content opportunities. We have captured many striking distance opportunities using BrightEdge. I love the Data Cube to find new keywords and competitor insights. BrightEdge is easy to use and easy to pull out actionable tasks to improve SEO performance. I feel like it would be helpful to have some additional navigation within Settings. I'd like to easily toggle back and forth between adding keywords and keyword groups. No easy way to do that today, without clicking back into Settings. Setup weekly or biweekly calls with your BrightEdge CSM to build the relationship and maximize their services. We optimize for individual business units, instead of our site overall. Building out separate keyword groups, page groups and dashboards has really helped tell our story for each BU. "Incredibly Poor Platform-- Use SEM Rush"
Unfortunately the whole platform is a fail and it's incredible overpriced. I discovered SEM Rush six months into our Brightedge contract and stoped using Brightedge. We will not be resigning with Brightedge-- no value to the customer beyond what is available. Support is OK but the product needs to be significantly improved. Use SEM Rush-- the features are amazing, the support rocks, and it blows bright edge out of the water from providing actionable tasks to help win organically. "Power user for 3+ years"
-Insights that help us focus our efforts on where they will make the biggest impact and track progress over time. -Comprehensive data with robust filter options let me drill down to the level of detail I need. -Helpful, responsive account managers and support team. -Annual conferences have loads of valuable content. When announcing new features for the platform, wish they would be clearer about release timelines, availability, and pricing. They build pretty innovative functionality but it's not always available without additional fees. As with any solution, implementing it will not automatically make your SEO better. It takes work, but it is doable for a small team to make a large impact using this set of tools. We have significantly improved our organic search presence, site traffic, and lead volume. "Very good - if expensive - SEO tool"
The StoryBuilder is a great way to build a report designed to answer a question that a client may have. The Recommendations for improving tracked pages are also very useful. I have occasionally experienced delays or interruptions in data collection which has made it necessary for me to contact their support staff. Work with your account rep to get the very best out of the tool and be sure to take the free online certification video classes. Not everything in the tool is intuitive or self-explanatory, and it is worthwhile taking the time to learn how to get the best out of it. I mostly use it to provide dashboards to stakeholders, but it's also very useful as a research and analysis tool, providing you complete all the possible integrations with Google Analytics and Google Search Console and plan keyword groups and page groups thoughtfully with scalability in mind. "Most comprehensive SEO tool there is"
The data cube they've invented pulls the best from Google Search Console and does all the heavy lifting. They also cache all the search console info so you can get historical. Their PLP process is very easy to assign keywords to pages, too. Customizing the dashboards can be tricky and isn't intuitive. The pre-built reports usually cover everything I need though. Organize your keywords into groups ahead of time so you can take better advantage of the reports. It's also useful to use the built in CRM to assign tasks to other users. Keyword tracking, identifying high value content and new visits. Everything is very well set up with page groups and keyword groups so we can easily identify what's performing well and what's not. We can easily pivot and change strategy to adjust for market conditions. "Unmatched Technology, Helpful Client Services Team, Access to Cutting Edge Data & Community"
How easy it is to get a quick overview of how we're performing for our main keywords. Plus the insights they provide around pages that have issues or errors. It makes it really easy to send to our dev team in order to make the fixes. For me the only downside is that I have to spend the time to go into the tool and set up the reports I want. Developing content that our users think is important. It's helped us move away from content we thought was important that was driving no traffic and had high bounce rates to more traffic with lower bounce rates. "A good tool for your website"
The Data Cube is one of the best features of the platform, but no the only feature I like. If you want to see how your competitors rank compared to you or to other site, the data cube gives you some really good insights on page ranks, search volumes and more. There's a learning curve for the platform, lots of different features and lots of time to really learn how to use them. Brigthtedge really does help with this and they have a good team of experts to answer all your questions. This is a product that I would recommend to definitely trail and see the great benefits of using it. There's lots of info that this platform can give your website, that your probably over looked. Brightedge is able to give us insight on the pages on our website that are ranking low on search engines and recommends to us what we can do to improve on this. "Automated Reporting Gets the Whole Organization On Board"
Once configured, the tool is incredibly powerful, and scales appropriately for a large organization. Our favorite feature is storybuilder, and we use it to provide valuable data on a monthly basis to various teams involved in content creation across the company. The biggest challenge is allocating the necessary resources to take full advantage of each feature. It can be difficult/tedious to re-assign multiple keywords between groups, and the limits placed on keyword tracking make hygiene a consistent concern within the platform, requiring upkeep more often than one might like. Brightedge has made it possible to monitor organic performance across the site, improve our rankings for keywords essential to our brand, and automate valuable reports to various stakeholders across our organization. While using the tool, we have seen organic traffic to our site increase by over 60%, in conjunction with a site migration. .
"Great Platform for Scaling SEO"
BrightEdge does a great job providing clear, concise data in an easy to understand UI. Like many SEOs, content creators and owners are not within the same team, so ensuring that these users can understand and prioritize content creation with SEO best practices in mind is critical, and I think that BrightEdge has always done a good job elevating these metrics making them actionable for the greater content teams. An area where BrightEdge can improve is through buyer journeys. I'd like to see content and corresponding KPIs visually structured in a way that lets users prioritize based on user experience on and off my website - focusing less on specific keywords but more on the entire thought process and potential searches that take plan to reach content- especially with voice search now bringing more long-tail keywords with low search volume, than less keywords with high search volume. Know exactly why SEO is important for your bsuiness, and what success looks like. BrightEdge can help set a path to a defined goal. 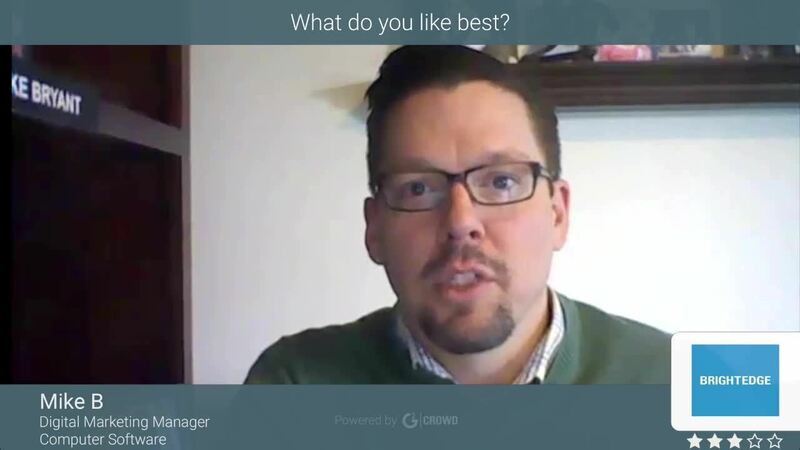 BrightEdge can be an overwhelming tool for those that don't have specific KPIs - knowing what you want will allow BrightEdge to help get you there. I've been spending most of my time understanding and monitoring keywords that drive awareness of our product solutions - influencing content creation, and on the flip side using BrightEdge to uncover terminology used for our existing product content for optimization. I continue to use BrightEdge to track and monitor our "high value" keywords that are driving the majority of organic traffic to the site. "BrightEdge, the SEO Platform for Digital Team with some to little SEO knowledge"
To further be integrated with log analytics or web crawlers, would be cool if they can integrate with companies like Botify. They don't give me the option to get my global ranking only by country. I don't have a comprehensive user report. I would like to understand what modules are used the most. Consider adding features such as web crawlers & log analyzers to understand what URLs have been crawled and indexed. Creating primary keyword phrases for every product group. Create dashboards for all the product groups to track content improvement. A modest and responsive UI design I can stretch it over my two screens. The UI is minimal, simple and clean. Colours have been designed and UI organised to allow both for extended screen time use, or for quick glances. Interactive help windows with pop up with functionality selection, and access help videos directly from the interface without losing where you were. Tried very hard to answer this question but to no avail. A bad tradesman always blame his tools, so to get the most out of Brightedge make sure you invest time to familiarize yourself and understand the platform, knowing the support team -second to none- has your back, and the research team is on top of the ever-changing search landscape. A true partnership, where the possibilities are endless. Finding additional keyword and topic opportunities that enable me to expand my site and capture new traffic, tracking and dashboards, and correctly attributing the channel. "A must for any enterprise level SEO team!" DataCube is one of the most defining features of the platform and it is fantastic. The UX of the platform is really well thought out and I can't wait to see new features to the platform. The level of customer service is beyond exceptional. I have spoken with competing agencies who offer sales people who really are nowhere near the same level as BrightEdge reps. You know you can trust them and they have access to the entire industry. They have introduced me to other customers and have helped build relationships. I wish that url's would update automatically instead of having to update them every time they change. I wish there was more flexibility in somehow tying a keyword level data to revenue but this in general is a complicated feature. At the same time the API does not allow access to DataCube. Make sure you speak with the rep that will be working with you potentially and maybe even give it a trial run if it's possible. The amount of data I analyze using this tool is pretty intense. I recently published an article on the analysis of 280K keywords for quick answer pattern examination. Analyzing the entire competitive landscape as well as really looking at areas for growth for our company. It's too difficult to come up with just one answer! First and foremost, this tool is extremely user friendly and has been the key to my success thus far! One of my favorite things about BrightEdge is that everything has a default setting, but everything can be customized to accommodate your client's needs. It is hard for me to keep up with all of the new enhancements to the tool. Prioritizing keywords and finding new/better keywords. The tool recommends keywords that I wouldn't have thought of on my own. This has helped me to properly optimize on page and off page for more traffic. "Excellent SEO platform for a large enterprise"
I've been using BrightEdge platform to drive SEO for many years. It is a very robust tool allowing us to measure results vs competitors, research opportunities that drive content strategy, identify technical issues, and much more. The platform is very flexible to manage and use and allows to scale our operation in all Geos. We get excellent level of support. BrightEdge product roadmap is very strong, and the team constantly introduces new features to make sure we get all we need with the rapidly changing search landscape. This is a tough one to answer - especially since "dislike" is a required field and I need 40-characters minimum to fill in the space :) I am satisfied with everything I get out of the platform. I need to scale SEO operations across multiple business groups, in all Geos - and I'm able to do that with BrightEdge. Customer support is awesome. Always available. Timely and very informed. The platform is expensive. It can be worth the cost, but it is expensive nonetheless. I would highly recommend this powerful tool. While it is expensive, the data available and the customer support is amazing. BrightEdge allows us to pitch new clients with a great deal of useful information. It is allowing us to better serve clients with greater depth and analysis. * We monitor all BrightEdge reviews to prevent fraudulent reviews and keep review quality high. We do not post reviews by company employees or direct competitors. Validated reviews require the user to submit a screenshot of the product containing their user ID, in order to verify a user is an actual user of the product. Hi there! Are you looking to implement a solution like BrightEdge?